You know those weeks when you feel like you don’t even have one minute to stop and breathe? Yep, that’s what this week has been for me. The farm is now in full swing, we’re painting our new wine shop, Little Sprouts starts in less than 2 weeks, Greg and I bottled our homemade wine, all of my friends are getting married and having bridal showers, and my darling goats just want to go for walks. We all have those weeks right? This salad is quick fix for busy weeks. So good, good for you and SO easy. I’ve already made it twice this week and might do it again tomorrow. We’re picking our own kale now which makes it even better. This year we’re growing 5 different types of kale. They are scattered throughout each of the plantings so I can’t even tell you when we’ll have each them. 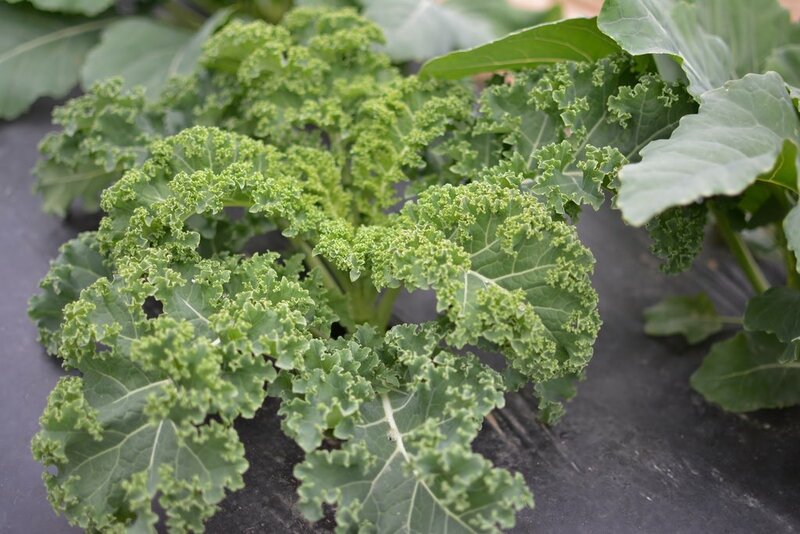 You might see a different type of kale every time you come into the market this year. There will be differences in the textures and colors and some are better for salads and others for soups. But if you ask me, all of the kales are basically interchangeable. I typically don’t eat any of it raw. Raw kale can have a bitter taste but it is easily tamed by cooking, or in this case, just slightly warming it with a warm dressing. The picture above shows our kale growing in the field. Like our lettuces, we grow the kale on plastic to keep it clean and free of dirt. This one is a curly kale which has a very firm leaf. Great for kale chips! I don’t always put the brussels sprouts in this salad but needed to mix it up a bit since I’m making it every other day. You’ll hardly notice them as long as they are finely chopped. BONUS VEGETABLE! I also make variations of this dressing each time. I use different dried fruits (raisins, apricots) or add vinegar instead of lemon juice. 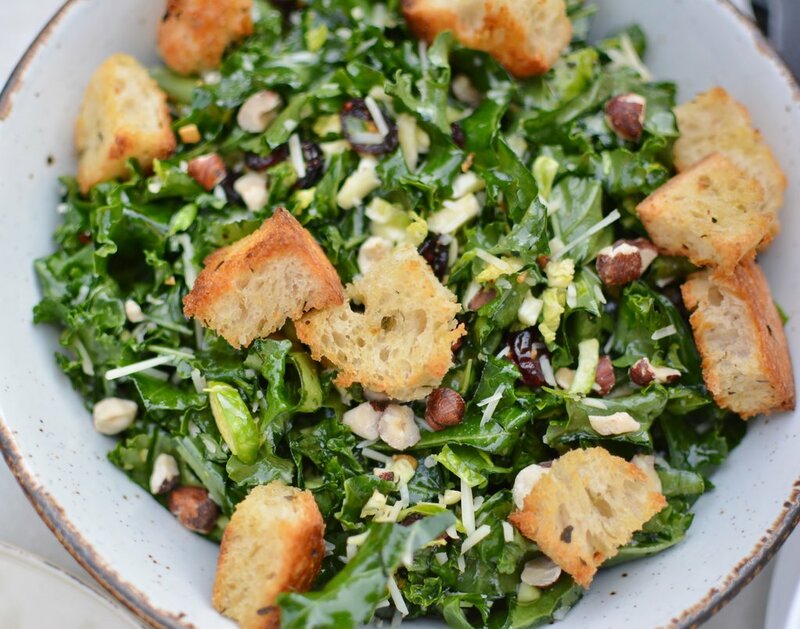 The key for the kale salad though is that it is a warm dressing to help break down the tough texture. And using your hands to mix it is a must. When you first pour the hot dressing on I recommend using a spoon until it slightly cools. Then use your hands and really massage the dressing into the kale. Add your extra toppings and enjoy! I only like to eat the leftovers the following day – beyond that, it gets too mushy for me. If I’m making it for a crowd I’ll just have everything chopped and ready to go and then just make the dressing about an hour before serving. Kale is so cool right now. Try it. 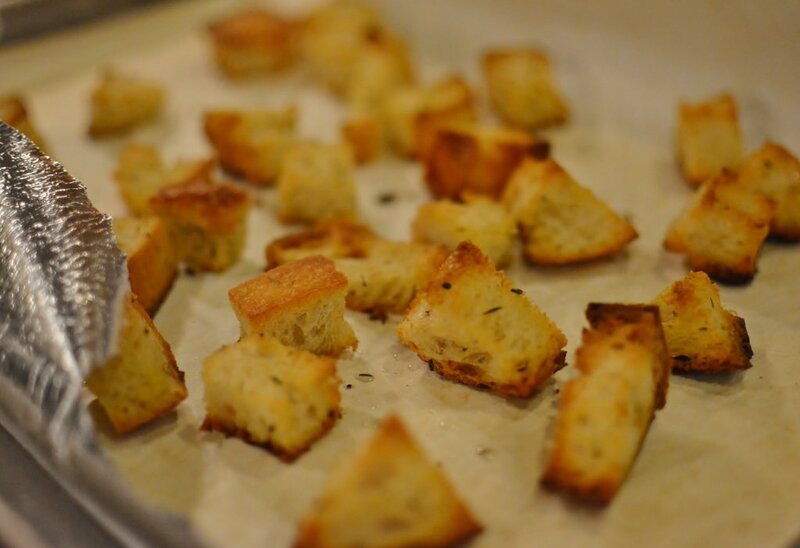 Preheat oven to 400 degrees F. Cut the bread into cubes and place on a parchment lined baking sheet. Drizzle olive oil over the bread and add a few pinches of basil, thyme and oregano. Toss the bread to coat. Bake for about 15 minutes or until lightly browned. 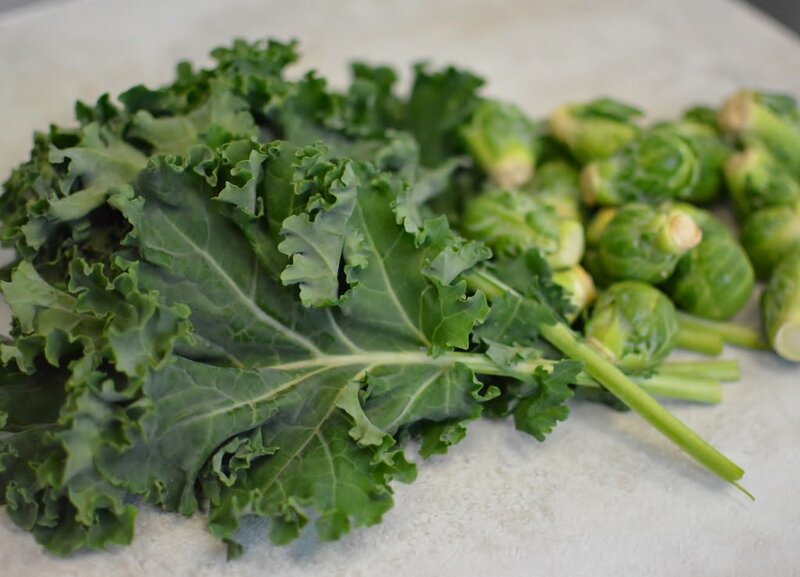 In a large bowl, combine chopped kale and brussels sprouts. In a small skillet, heat the olive oil over medium heat and add garlic. 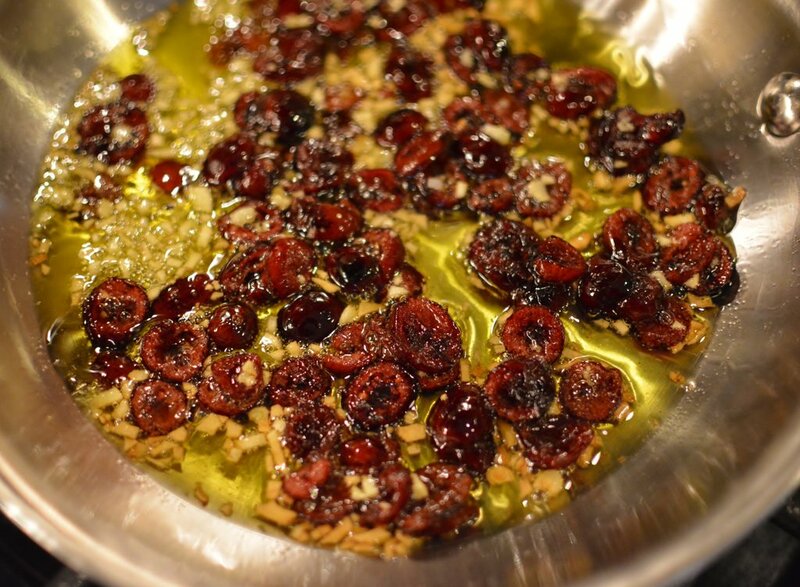 Cook for about 30 seconds, add dried cranberries and reduce the heat to low. Cook for about 2 minutes and remove from heat. Add lemon juice and a pinch each of salt and pepper. Mix to combine. 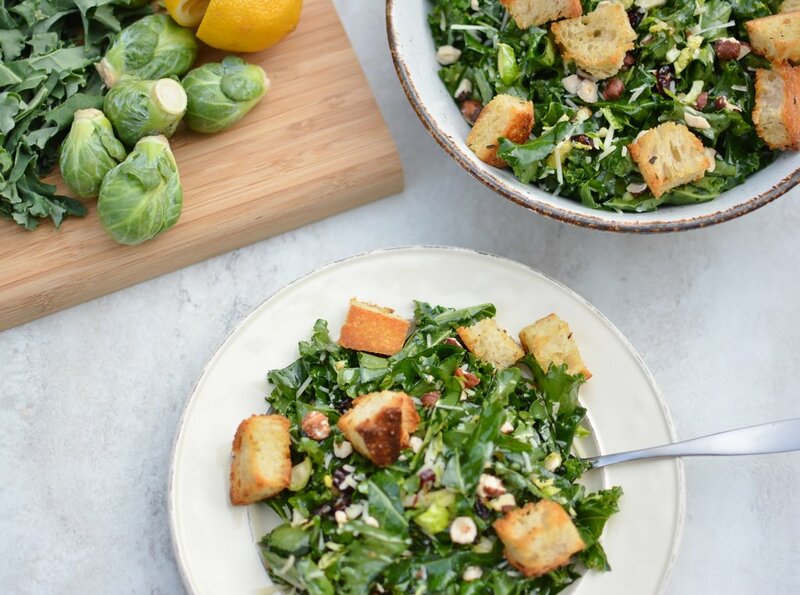 Pour the hot dressing over the kale and brussels sprouts mixture and toss with a spoon until the dressing has cooled slightly. 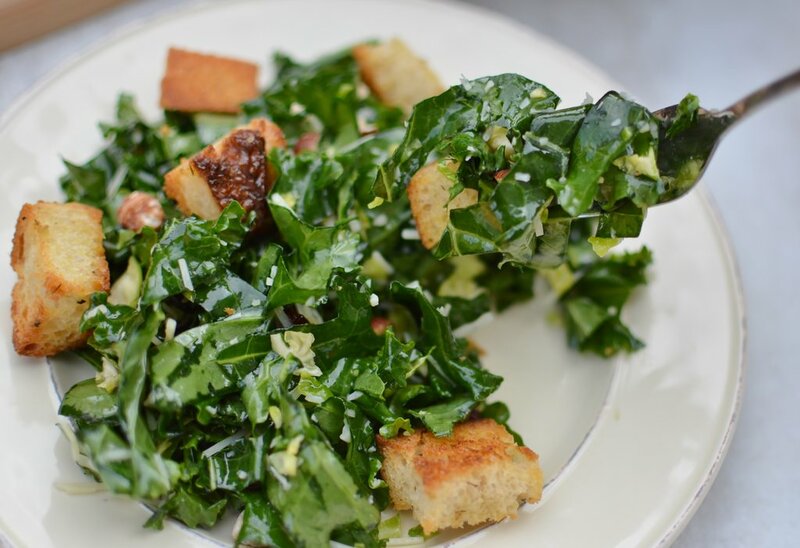 When cool enough to touch, massage the dressing into the kale. Add the hazelnuts and parmesan and toss until well combined. Top with breadcrumbs. Yes, Ann, you can absolutely use cashews or other nuts instead of the hazelnuts. I’ve used both walnuts and slivered almonds too! 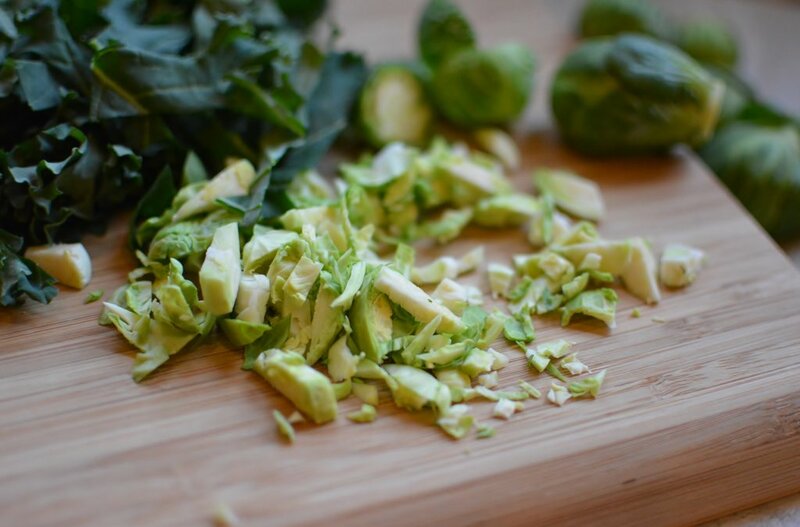 I would not recommend frozen brussels sprouts – I’d just leave them out if you don’t have fresh!